We cooked up a storm this weekend at Feast Portland, the major food and drink festival of the Pacific Northwest. It was our third time at the event sharing our Portland made goods and treats during the sold out Grand Tasting, the festival’s largest tasting event. At Feast’s Grand Tasting Friday and Saturday we debuted our newest product, Bunches & Bunches Provisions Jerk Sauce. Over 2000 servings of our Jerk Chicken with a grilled pineapple and black bean salsa flew out of our hands and made the local TV news. 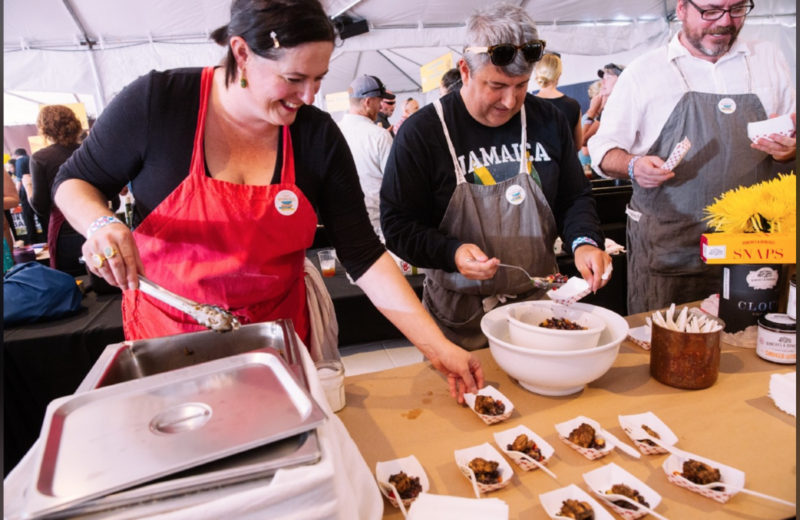 Our favorite things about Feast are sharing our products – seeing the delight on people’s faces as they enjoy the flavors, meeting other amazing chefs and makers, and the music! Great DJ this year. Our Jerk Sauce is inspired by the flavors and spices used in Jamaican jerk sauces, marinades, and Caribbean style barbecue. It is gluten free, easy to use, and made with ingredients that we are proud of. We think you will love the taste. It will be on shelves and available via our website in a few weeks. Stay tuned! Bunches & Bunches of love.